After two launch attempts were scrubbed due to weather concerns, the space shuttle Discovery finally lifted off for the International Space Station (ISS) with its seven-member crew at 2:38 p.m. on Tuesday, July 4  the first-ever shuttle launch on Independence Day. 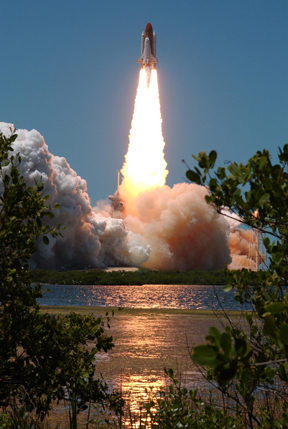 The launch marks NASA's second shuttle mission since Columbia broke apart upon reentry over Texas on Feb. 1, 2003, and the first since the shuttle fleet was grounded last summer. The holiday launch went ahead despite the discovery on Sunday evening of a crack in the foam insulation of the shuttle's external fuel tank. Space shuttle Discovery lifts off for the International Space Station on July 4, making it the the first shuttle to launch on Independence Day. Images courtesy of NASA. The crew of the second "Return to Flight" mission, known as STS-121, will test new procedures and equipment designed to enhance the safety of shuttle flights. The tests are part of a continuing analysis of improvements originally implemented and tested on Discovery's first Return to Flight mission in July of 2005 (see Geotimes, July 2005). The new procedures and equipment are aimed at addressing the shuttle's recurring problem of shedding foam insulation from its external fuel tank during launch. Falling foam was to blame for damaging Columbia's protective heat shield, ultimately leading to its tragic explosion. Despite efforts to correct the problem, however, Discovery also shed a piece of foam during its first post-Columbia mission last year. Although the foam did not damage the shuttle, NASA grounded the shuttle fleet until now to study the problem further. After thorough inspections on Monday, NASA officials determined the crack in Discovery's foam insulation was not of sufficient concern to call off the launch. Small pieces of foam did fall from the shuttle during its launch Tuesday, but they broke off after a critical period  about a minute and a half into the launch, says Robert Mirelson, a NASA spokesperson. Hence, the falling foam posed less of a threat to the shuttle, he says. Still, Mirelson says, "everything will be evaluated." Starting today, Discovery's crew and the crew of the ISS are using photography and videography to obtain "unprecedented coverage" of the shuttle  part of the new safety improvements. NASA will then use the imagery to examine the shuttle for anything that could "cause problems during descent," Mirelson says  for instance, damage to areas such as the shuttle's leading edge or wheel wells. Preliminary reports, however, show no cause for concern. A major objective of the STS-121 mission is to visit the ISS, onto which Discovery will dock during the third of its 12 days in orbit. Discovery's astronaut Thomas Reiter will join the current two-person crew aboard the ISS and remain there for several months. Discovery crewmembers will also perform maintenance on the ISS and deliver more than 28,000 pounds of equipment and supplies needed for future expansion of the orbiting outpost. 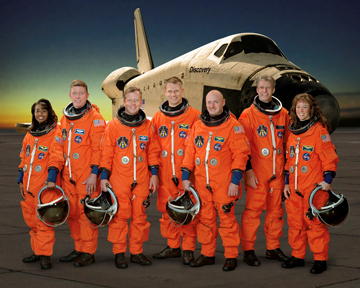 The crewmembers of Discovery's STS-121 mission are (from left) Stephanie Wilson, Michael Fossum, Steven Lindsey, Piers Sellers, Mark Kelly, Thomas Reiter and Lisa Nowak. Expansion and completion of the ISS, targeted for 2010, is a critical first step in President Bush's "Vision for Space Exploration." The plan calls for a manned return to the moon by 2020, and subsequent exploration of Mars and beyond (see Geotimes, June 2004; and current print issue). The ISS will support these goals by providing a place for researchers to study the effects of space on astronaut health and capabilities. NASA anticipates flying the space shuttle about 16 more times to finish assembly of the ISS, after which the shuttle fleet will be retired in favor of a new Apollo-shaped spacecraft that can carry humans to the moon and Mars (see Geotimes, July 2006). Mirelson says the STS-121 shuttle mission is critical for "evaluating new shuttle processes" and "a key step" toward the space program's future. "Every mission is a stepping stone," he says.